When installing X-Rite hardware and software, some files must be written into folders that are considered to be part of the operating system's core. Vista features "User Account Control", or UAC, which can interfere with your installation. You may see one of several different error messages is displayed and your installation process terminated because Vista has interpreted the installer as being a "silent" install, often associated with malicious activity. Even a system administrator may be prevented from completing the installation. Below are the steps required to temporarily disable this feature. Following a successful install, you may turn UAC back on to assure that your computer is fully protected. Open the "Control Panel" and then "User Accounts". 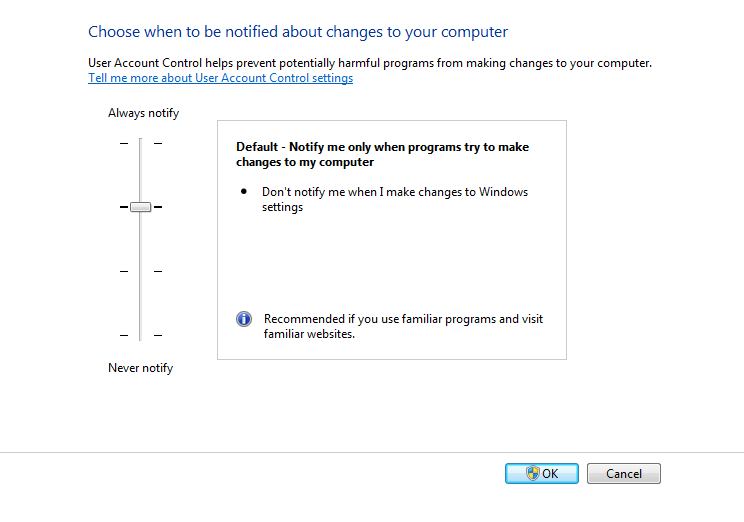 Uncheck the "Use User Account Control (UAC)..." prompt. Next click on "OK". Following this you will be prompted to restart your computer so that the changes can take effect. Install the X-Rite application. Following a successful install, you may repeat the steps above, this time placing a check in the UAC checkbox. This will re-enable the security switch protecting your PC from malicious "silent" installs. Note: You should always be logged on as a full administrator to install X-Rite software. Generally speaking this level of access is not required following the installation process, except when an application needs to write an ICC profile into the Windows Vista's color management folder. This is a core, protected folder and only administrators may make changes in this location. Because of this, persons creating ICC profiles will be required to have full administration access on the local machine. 1The primary difference between a standard user and an administrator in Windows Vista is the level of access the user has over core, protected areas of the computer. Administrators can change system state, turn off the firewall, configure security policy, install a service or a driver that affects every user on the computer, and install software for the entire computer. Standard users cannot perform these tasks and can only install per-user software. On the Windows 7 Platform this is done by going to Control Panel > User Accounts and selecting Change User Account Control Settings. Once this opens you will need to move the slider all the way to the bottom set to "Never Notify" as in the screen shot below. This will prompt you to reboot your computer before these settings take effect.